Sometimes you hear about a new show, catch an episode and then, almost instantly, you're hooked. Well at least I am. You could say I get attached to easily, to shows that is. It's annoying: not only is that yet another evening that you cant go drinking, it's precious mind-time sacrificed to wondering how the characters are going to cope with the latest plot twists. And it means you're going to like your friends a little less if they don't share your enthusiasm. Suits is a slick, witty, intelligent and stylish legal drama and it is clear that we are all hooked. 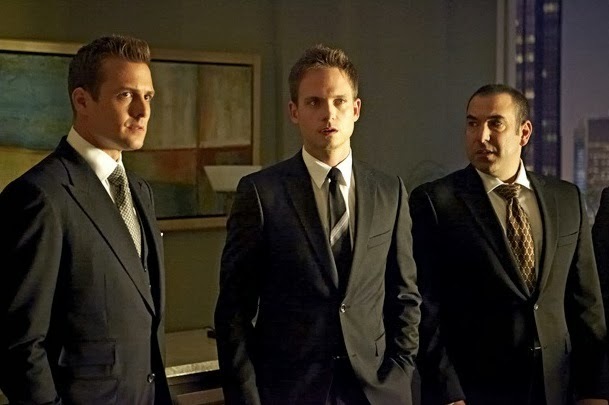 It doesn't seem too selfish of me to dedicate a whole post to the style throughout suits, especially only hours after the show aired the first of several episodes to conclude season three. A suit is a piece of sartorial armour that can serve a man through every battle and triumph he faces - from bar to boardroom. It is the easiest, most flattering item we can wear. A good piece of tailoring can straighten backs, flatten stomachs and mask hangovers, imbuing its wearer with confidence and clout. What's not to like? While there have been some momentously stylish suit wearers on television, the current prize has to go to Harvey Specter, one of the two main characters in Suits. Harvey gets to wear impeccably tailored suits from Tom Ford, handsomely proportioned ties confidently fastened with a half Windsor knot, and the final flourish of a natty pocket square. It's a look that manages to be traditional and yet supremely contemporary. And it doesn't stop there. Lets not forget Mike Ross and Louis Litt. However, it is not only the men who are well dressed. For the Jessica Pearson, Rachel Zane and Donna Paulson characters, the wardrobe is very aspirational, body conscious, and elegant. With those characteristics in mind it is no surprise that the women are dressed in designer labels like Dior, Victoria Beckham, Prada and Burberry, mixed with vintage pieces. Jessica Pearson's outfits should be the most sophisticated—her name is over the door after all. Her clothes are meticulously tailored and architectural, with interesting necklines. Rachel’s outfits are probably the most body-conscious of the three, and let’s face it, she is pretty fit. Her character tends to favor separates– mostly slim-fitting sweaters or button-down blouses paired with pencil skirts. Donna is probably one of my favorite characters, if not my favourite, but her wardrobe may not always be the most office-appropriate. She has the most varied clothing, but she has been outfitted in a lot of knit dresses with plunging necklines. Maybe these should be saved for going out. 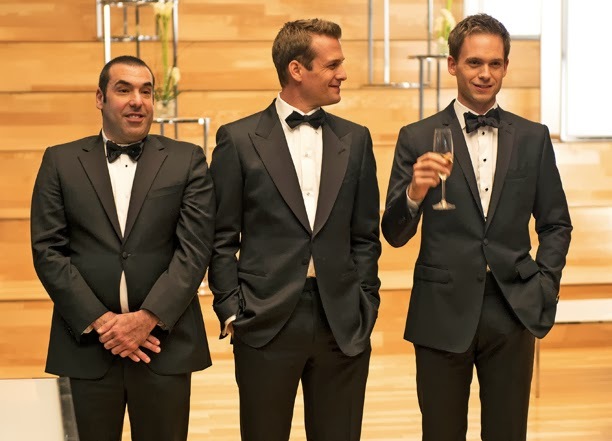 Their legal minds make the lawyers of Pearson Darby Specter the best in the business, but it's their winning wardrobes that make them the sharpest team on television.